The best way to profit in life is to avoid the worst mistakes. Once you stay alive, you have an opportunity to profit. Many beginners get discouraged at the earliest stage only because they make a common but CFD trading mistake. Here’s a list you should go through before you start trading with your live account. People new to trading CFDs make the mistake of thinking you need to strike an exceptional intuitive order to make money. The market is strongly going up and they try to “feel” the moment the trend turns. The same with a downfall, they try to buy low. What are the odds you will hit the jackpot during a long-term trend? Hunting for a wonderful opportunity is a well-known psychological bias. 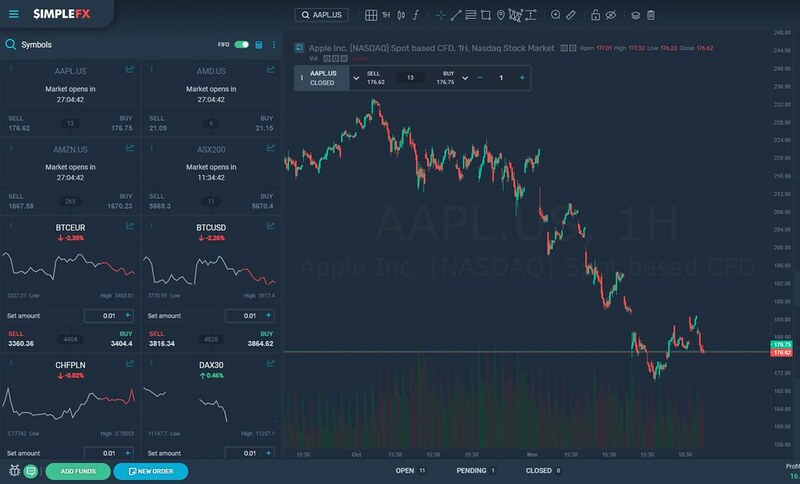 Take a look at this Apple downtrend. Taking long positions and buying low is very risky. Instead, a beginning trader should try to open short positions during local bounces. As a novice, buy lows when the instrument is trending up and highs when it's trending down. Going with the trend should be your starting approach. Especially when you are learning and want to avoid the biggest beginner trading mistakes. You have to know this is relative. 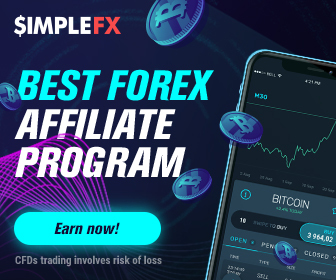 With SimpleFX you have no minimum deposits. There’s no barrier to a trade. You can start with $10, $100 or $1000 dollars. But you need to know that you should open positions that amount only to a fraction of your available deposit. Otherwise, you have no room for an error, and the whole process is just a lucky draw, where your odds are quite low since you lack experience. What is “too big”, $50 for one order in a $1000 account would be too big for a beginner. Try not to open positions for more than $20, that is 2% of your account's capital. This is a cardinal mistake. You are putting yourself at an extremely high risk of losing money. Using SimpleFX WebTrader you probably aim at trading highly volatile assets such as cryptocurrencies or forex. Probably you want to trade with leverage. This means you have to protect yourself from a costly mistake. Use stop losses from the get-go. Make sure you set a wise stop loss level opening your first position. This is also a very common mistake. Once again, when you are trading on a volatile market you cannot set stop losses to tight. You predict a scenario to happen and should give yourself a chance. Let’s take a look at the situation above. 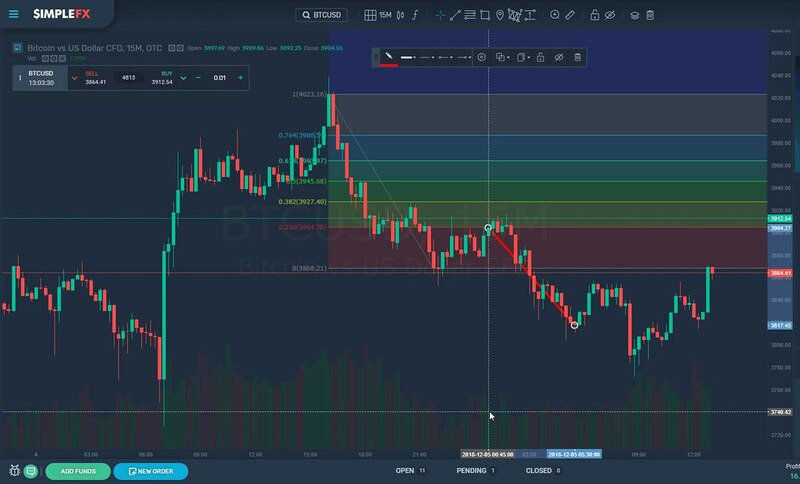 You used Fibonacci Retracements tool to open a sell BTCUSD order at the price of 3904, on 2018-12-05, 00:45. Your prediction turned out to be correct, and over the next five hours, you could make a nice profit. However, if you set a stop loss too tight (maybe because you were trading with too bog stakes), the order closed too early. What was not your mistake, just a market noise stripped you of your chance to make money. Don’t be afraid to use wider stops on volatile markets. Set them at logical levels that would work when your prediction proves to be really wrong, not that it’s just a market noise. 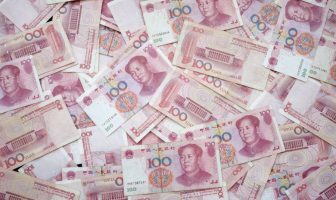 Nobody makes a long-term profit on financial markets with just pure luck. You need to understand that it’s not just a 50/50 percent coin toss. You need time, and room for mistakes in order to learn how to make money using any of the CFD trading platforms. As a novice, you need a plan much more than experienced traders, who can trust their instincts. You are probably biased and your intuition will bring you more harm than good. Try to earn some money sticking to a plan before trying some improvised trading. You may analyze just the chart, you may also react to the news. Both strategies are good although they work best when combined. One common beginner's mistake, however, is dedicating too little time to your trading strategy, and too much to watch the news. The media always make things overblown. The TV will show you too many details too many analysis, and this will bring confusion. Absorb the news, try to work out the big picture. Listen to some experts you really trust and forget about all the entertainment business. Remember - time is valuable in financial markets. It’s a currency. Make sure you spend it on valuable activities such as developing a trading strategy, following experienced traders and reading and watching tutorials, not TV news. This is also one of common day trading mistakes. Once again - time is money - and as a beginner, you don’t have skills enough to cover all the markets and instruments. Your main goal is not to lose money to quickly - give yourself a chance to succeed. You need many tries, but it’s better to extend them in time, not across all the markets. There are many markets you can excel in using SimpleFX WebTrader. Make sure you start with one - be it a cryptocurrency, forex (limit the pairs to a region) or stock (start with a sector or a stock exchange you know best or are interested in). Good luck. Avoiding these mistakes will protect you from losing trades, and will give you more chances to succeed and learn. Previous ArticleWhat will happen to Bitcoin mining industry? Will it threaten the system? Next Article The End of 2018 Crypto Crash?